In Guilt and Forgiveness, Dr. R.C. 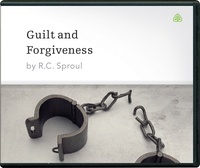 Sproul teaches that God’s Word declares us sinners, meaning that we should indeed feel guilty. Only when we experience grace — trusting in Christ as our Savior, confessing our sins, and asking for forgiveness — do we deal effectively with guilt and experience real freedom.